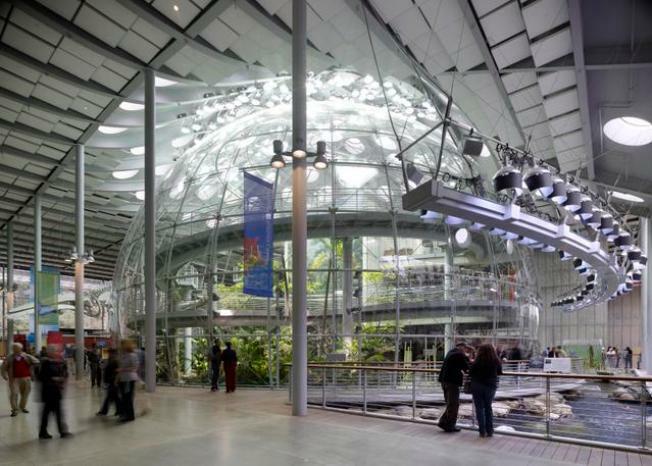 Inside the four-story rainforest dome, visitors can meet live rainforest residents from Borneo, Madagascar, Costa Rica, and the Amazon. Photo © Tim Griffith. Who would have thought that the sengi, a furry African mammal that looks much like a mouse with a long nose, is in fact a close relative of elephants and anteaters, and not a rodent? And who could have imagined an extinct mammal that had a huge shovel-shaped "tooth" or a whale that walked on land? This and many other fascinating mysteries of evolution and paleontology are explored in "Extreme Mammals," a new exhibit at the California Academy of Sciences in San Francisco's Golden Gate Park and the first major new exhibit since the museum's opening in 2008. Produced in conjunction with American Museum of Natural History in New York, "Extreme Mammals: The Biggest, Smallest and Most Amazing Mammals of All Time" demonstrates that there's a lot about the world that we have not discovered. And perhaps there is no better place to test that perspective than in the world of mammals, which is as complex as it is varied. Mammals have been around for millions and millions of years, as the imposing 15-foot model of indricotherium, which stands at the entrance to the exhibit, demonstrates. The largest land mammal ever discovered, this relative of the modern day rhinoceros reached up to 20 tons, ate only plants and lived between 34 and 23 million years ago. But mammals were also incredibly small. Batodonoides, a relative of moles, weighed just 1.3 grams and lived 50 million years ago. "Extreme Mammals" includes many fascinating skeletons of long-extinct animals, including the rare exact cast of the skeleton of Darwinius masillae, a small, delicate, long-tailed mammal living 47 million years ago. The skeleton of this proto-primate is astounding, not only because it is beautifully preserved, but also because of its completeness. Every tiny bone is present, as are outlines of skin, patches of dark fur and even the contents of the animal's stomach. There are also taxidermy specimens, a diorama of a large mammal 50 years ago, chomping on vegetation in a swampy terrain close to the North Pole, models, diagrams and interactive activities. In addition, to complement this exhibit, the museum has adapted signage in its other exhibits to highlight extreme adaptations in other contexts. "Extreme Mammals" continues through Sept. 3.